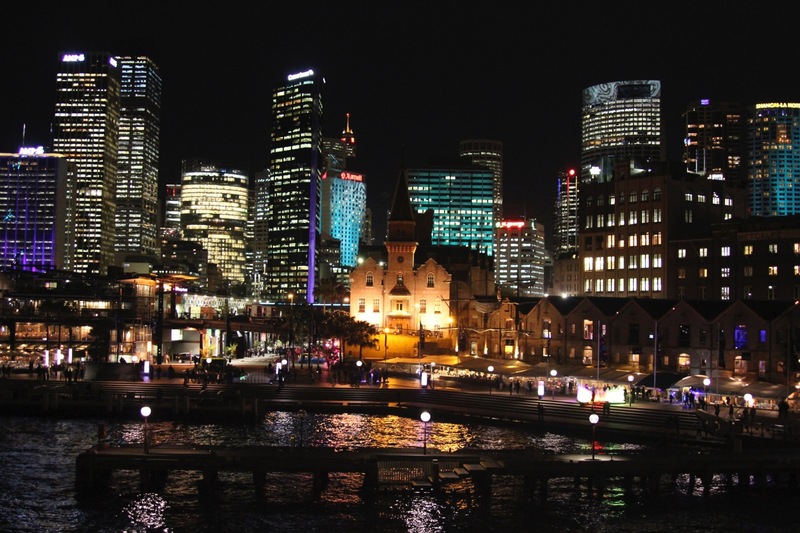 Heralded as the premier property in the Park Hyatt portfolio, would the Park Hyatt Sydney live up to its reputation? After arriving from Canberra by train, we checked into the property on a cold and rainy June evening. The hotel was sold out and we were assigned a Harbour View King. The base room at this hotel is “1 King Bed” which has a fairly disappointing view of Hickson Rd. I was thankful for the slight upgrade. We used two Hyatt vouchers from Chase for this card, an excellent use of the credit card’s (prior) sign-up bonus. Nightly rates were over 800AUD (~616USD). Although we preferred separate beds, the only “base” room available at the hotel was with a king bed. Unlike many Park Hyatt properties, we were not escorted up to our room. The room was comfortable: not huge, but reasonably spacious with a large table, two plush chairs, and a coffee table in addition to the bed. The bathroom featured a separate tub, shower, WC and dual sinks. The view of the harbour from our room was excellent and if you stuck your head out the window, you could also see the Opera House off to the left. As I wrote about in an earlier post, our heater didn’t work. And it truly was cold in the room. While the hotel quickly sent maintenance up to fix the issue, the two engineers were unable to fix the problem. Thank goodness for robes and warm comforters! The following morning we were upgraded to a Harbour View Deluxe room, a very nice upgrade. That room will be the subject of a separate post. But I’ll add here that we had a problem in the new room as well: the keycard did not work. In fact, no keycards work. The engineers were summoned once again and ended up dismantling the door handle and putting in a new unit. That fixed the problem. The hotel was quite apologetic and the upgrade for my second and third nights made the “inconveniences” worthwhile. Even so, I was surprised that we would run into technical issues in both rooms. The front-desk staff was excellent. After the heater incident we were addressed by name by the front desk staff every time we went by. That’s service. And lest you think this was the red carpet treatment for a blogger, this stay was in June 2013 back when my blogging could only be classified as inactive. Service seemed genuine and always professional. Restaurant recommendations? No problem. Help with public transportation? Certainly. And I expected nothing less from a hotel this expensive. Breakfast was a delight not just for the food, but for the views of the harbor and Opera House. Enjoying a leisurely breakfast here each morning was not just a highlight, but the highlight of our stay. The “Dining Room Breakfast” for 45AUD (free for Globalist members) included a buffet with cold items plus any “item” from the a la carte menu. I was told that I was not limited to one item, but could have essentially whatever I wanted from the a la carte menu. Over our stay we tried many different dishes and each one was amazing. In ranking my favorite hotel breakfasts in the world. this one comes out near the top. Here’s a look at the breakfast menu (.pdf). While we ate most our meals outside the hotel, we had one late-afternoon snack on our final day at The Living Room, the hotel’s bar and lounge. We were not all that hungry so just ordered beef sliders. I also tried a Mai Tai, my favorite cocktail…it was excellent. The heated rooftop pool boasts amazing views and was oddly deserted the one afternoon I visited, despite the full occupancy at the hotel. Cabanas are available and a small hot tub is as well. The fitness center was on the small side, but still sufficiently equipped to encourage a great workout. Spa treatments were too expensive to justify, but the facilities appeared very nice. Wi-Fi is free and available throughout the hotel. If needed, however, a business center is available near the lobby. The hotel’s prime location in the heart of Sydney is another selling point. You’re just a 10-minute walk from Circular Quay (museums, shopping, resultants, and Metro) and a few paces from Sydney’s Harbour Bridge. You’re within walking distance of the Opera House and Royal Botanic Gardens. Expensive? Yes. Flawless stay? Nope. But in terms of aspirational hotels to use your points in, this property is difficult to beat. Stay tuned for my review of the upgraded room. Previous Article $10,000 Voucher for United Airlines Bump!